Mornings in Myanmar are sublime. Many of the country’s days pass in a haze of rain and sweltering heat, making the clear, temperate mornings feel like a gift. Like the locals, I found myself rising early, not wanting to sleep in and miss even a few minutes of the early morning and its gentle sunlight. Staged photo, single shot, focal length 14 mm, aperture f/2.8, shutter speed 1/1250, ISO 3200, handheld. The fishermen on Taung Tha Man Lake get out early as well, guiding their long, slender boats out onto the still water as the locals on shore are just beginning to stir. The lake, generally placid at any time of day, is especially beautiful in the morning, when the sky is reflected perfectly on its surface. Unlike the fishermen I encountered at Lake Inle, the men at Taung Tha Man Lake are not merely fishing for the entertainment of camera-wielding tourists; fishing is their livelihood. They may oblige a tourist here and there with a photograph, but the work they are doing is real work. It’s also arduous. Their nets — heavy with lead weights — are flung into the air. They meet the water’s surface fully expanded, sending a gentle spray of water into the sunlight. I made arrangements to go out onto the lake early one morning with two fishermen. That first morning was mostly a learning experience — after I got over my amazement at their strength and agility I found it was much harder to photograph them at work than I had anticipated. I wanted to capture the net in flight, but it required a very fast shutter speed in a low amount of light. My first day on the water was largely spent learning how to photograph them, with few of the photographs worth keeping. I went back with them the next morning. The weather was even more agreeable than the morning before, with the colors of the sky and the sunrise reflected beautifully in the water’s surface. 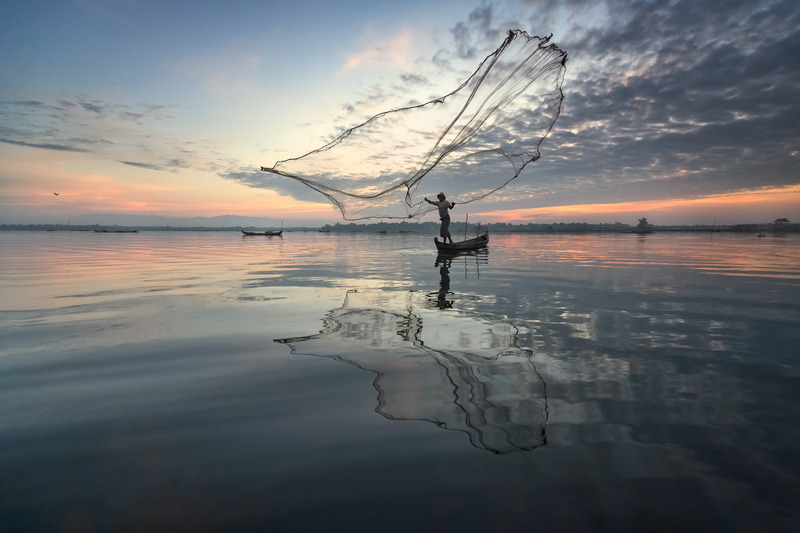 I was engrossed in what I was doing and the morning passed quickly, and before I knew it, the fishermen were leading the boats back to shore to sell that day’s catch.